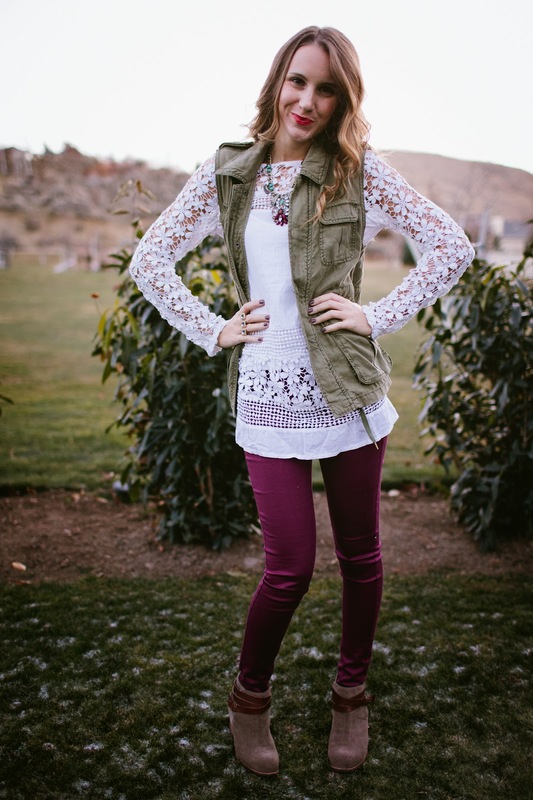 Vest: American Eagle – SIMILAR and LOVE this version with fur! Here’s PART 2 of my Color of the Season feature! For this outfit, I opted for these skinny’s in my latest favorite color. The bright hue really add’s the perfect touch for a dreary winter day! 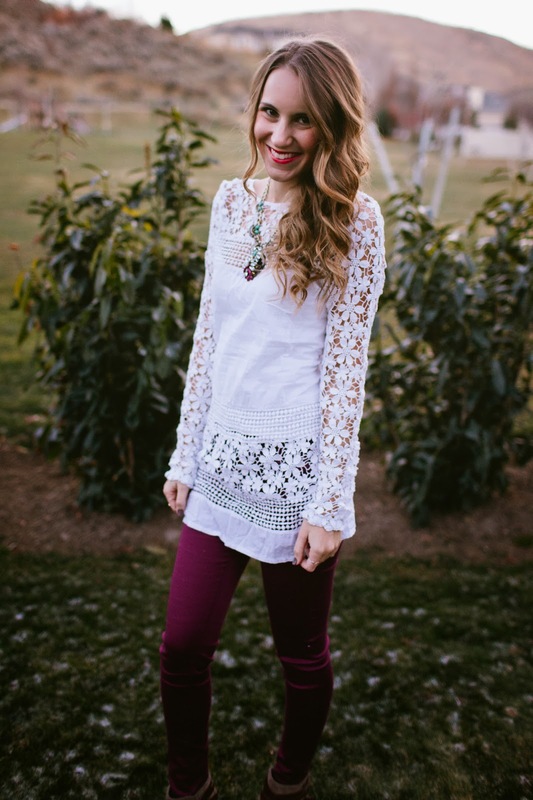 This gorgeous crochet top from E’s Closet is definitely summery, with it’s crochet detailing and bright white hue. However, it is right on trend, following the Winter White theme seen everywhere these days. You better believe I will be rocking this all year round! The delicate crochet detailing, gorgeous back zipper, and longer tunic fit make for the PRETTIEST top I have ever owned. It’s ridiculously dreamy, and I feel like every girl should have this piece in their closet. Adding a green cargo vest, some pretty jewels and my FAVORITE booties, I felt ready for date night or work. New favorite outfit? I think so! By the way, check out E’s Closet. They have some of the CUTEST pieces, and the I was blown away by the quality of this top! Check them out now, especially the gorgeous Francesca Vest I am currently drooling over and the dreamy Florence Peplum Tunic. *Le Sigh* Can these just be in my closet now?!? Beautiful tunic! I love how delicate and feminine it is. Those pants look fantastic with it! loved the color of ur pants ashley! This outfit is perfection! I adore the top! Oh Miss Ashley, you always make the prettiest color combos! This deep magenta with the olive is just perfect. Honestly, it's one of my favorite color schemes to work with in art right now. So forest-like and magical!! I hope you have an excellent weekend, my pretty. The color of those jeans is stunning on you! I love the whole outfit! I love this entire outfit – the top is gorgeous and super unique, and I love the color of those pants! And, as always, I love those boooooties!!! okay, love this outfit tooooo!! That top is the cutest!!! 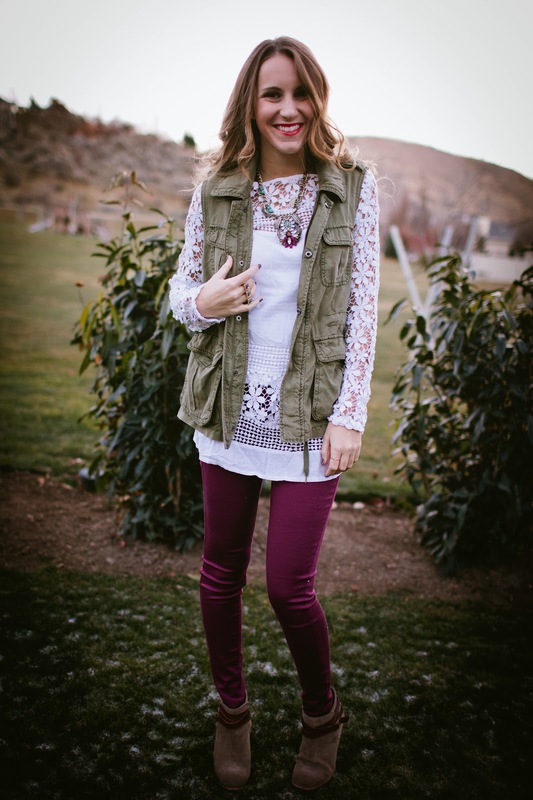 and I just love how you styled it all, the vest is so cute! 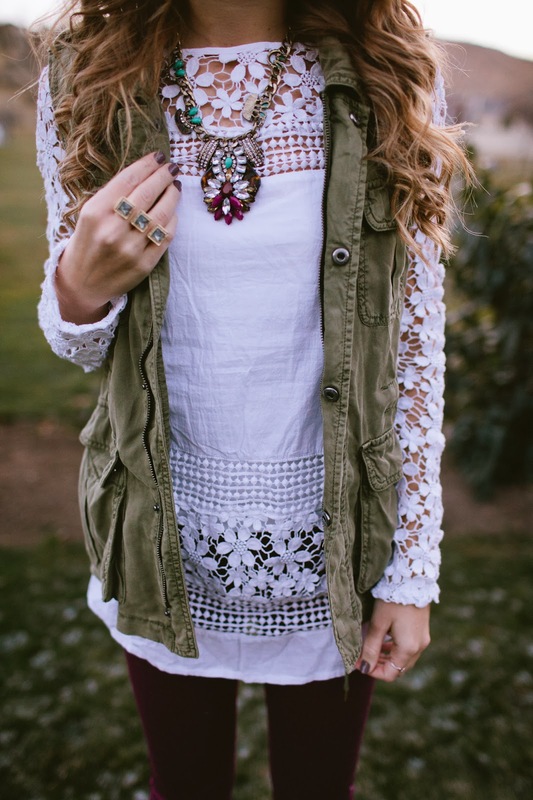 A perfect bohemian look! Love this. anywhere I can purchase this top from somewhere!? obsessed!! !